A Dutch version of this blog is out today at ModeMuze.nl! Janet Arnold is a household name for everyone who’s interested in the construction of historical clothing. In the 70’s and 80’s, she published several books with detailed patterns of existing garments. This Patterns of Fashion series is still one of the most used when it comes to recreating historical clothing. Part 1 is about women’s fashion from 1660 to 1860, part two about women’s clothing from 1860 to 1940, and part 3 women’s and men’s clothing from 1560 to 1620. Janet Arnold passed away in 1998, leaving her work, in a way, unfinished. 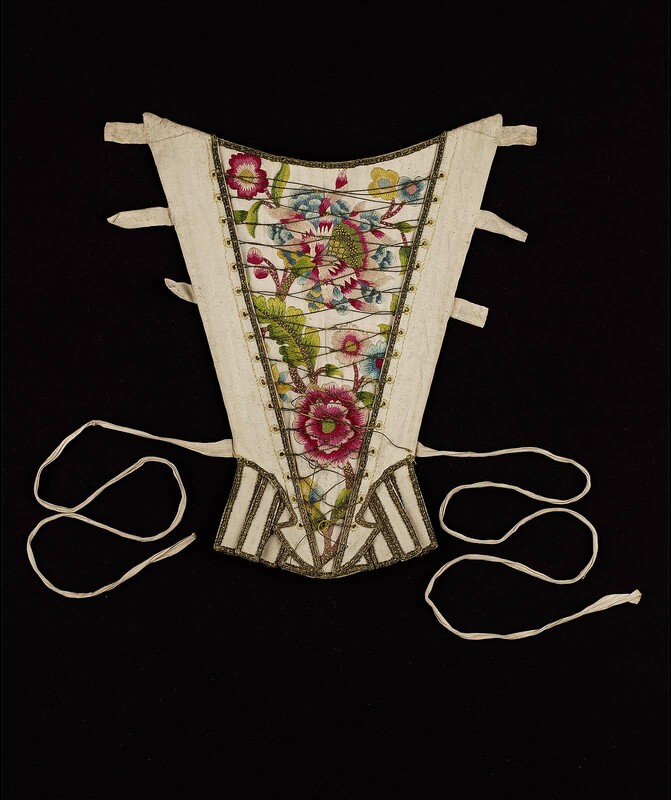 She had multiple further Patterns of Fashion books planned, and in 2008 part 4 was published, about linen undergarments and accessories from 1540 to 1660. This book was planned by her, and finished by Jenny Tiramani and Santina M. Levey. However, there was a lot more material. 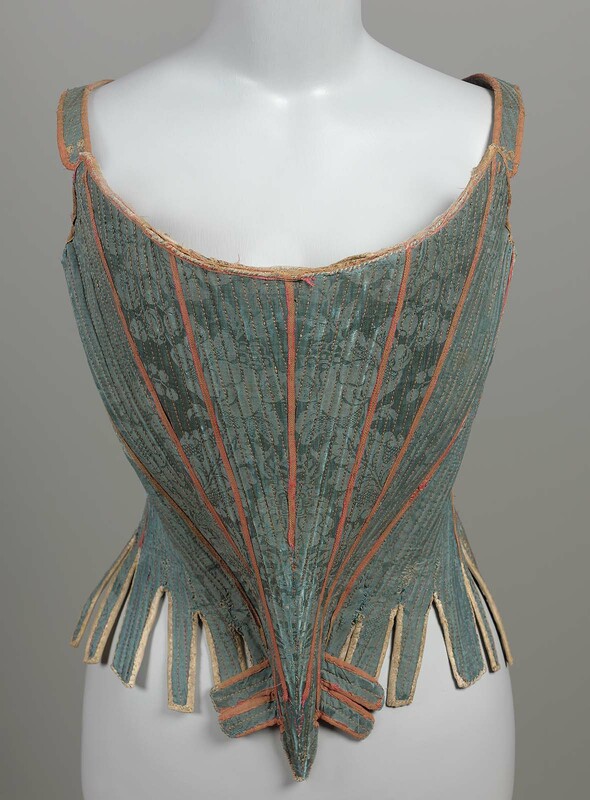 From her legacy, the London School of Historical dress was founded in 2012, also housing her collection. This includes her pictures of originals, and the patterns she’d taken. And, end of this October, the latest book in the series will be published. 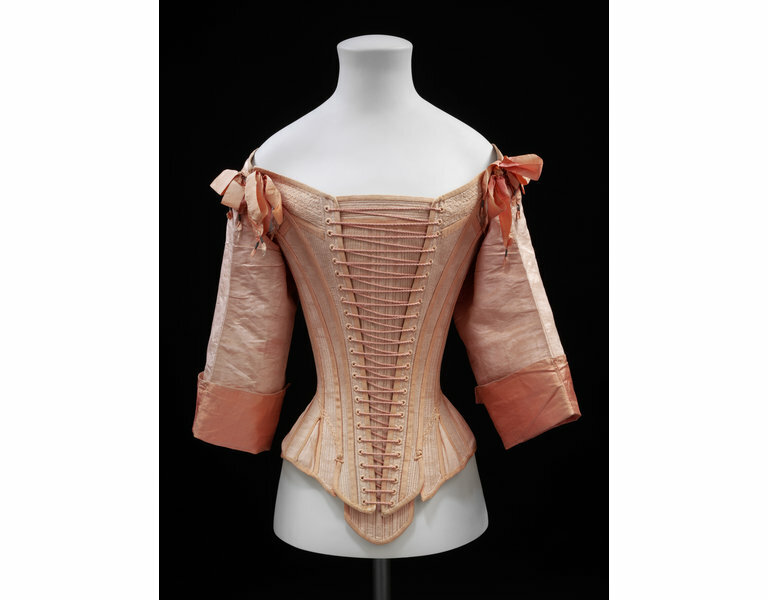 Patterns of Fashion 5 is about ‘structural’ women’s garments from 1595 to 1795. Bodies, stays, hoops and rums. From the material and legacy of Janet Arnold, but supplemented thanks to modern techniques and new research, by Jenni Tiramani and Luca Costigliolio, with the assistance of Sebastien Passot, Armelle Lucas and Johannes Pietsch. In color, with detailed photographs, x-rays and patterns including all the different layers of the objects. I had the pleasure of receiving my copy early at the Structuring Fashion conference in Munich, so in the rest of this blog, an overview of what to expect from the book! The pictures below present a small selection of the objects which can be found in the book. The book starts with an extensive introduction, with a lot of information and new research using primary sources. It includes a description of the different types of materials which were used. Very useful, as words don’t always mean the same thing now, and some materials aren’t produced anymore. It also includes a description of how fashion evolved, and how these garments were made historically. It’s definitely recommended to actually read the full introduction, despite the temptation to only look at the pretty pictures, as it contains a wealth of information. And now the patterns, because that’s what it’s all about in the end. All patterns are drawn on the familiar inch-grid, including a legend with cm, and the rulers in the end of the book. New in this book is that the patterns were drawn larger, and then scaled down to make them more precise. Also new is that many of the layers are shown individually. For some of the stays, the strength layer is not cut the same as the outer layer, and the lining might be different still. This makes it very difficult to get to the pattern of the inside layer. This is one of the places where the x-rays come in handy. The patterns also show very clearly how the object is stiffened. 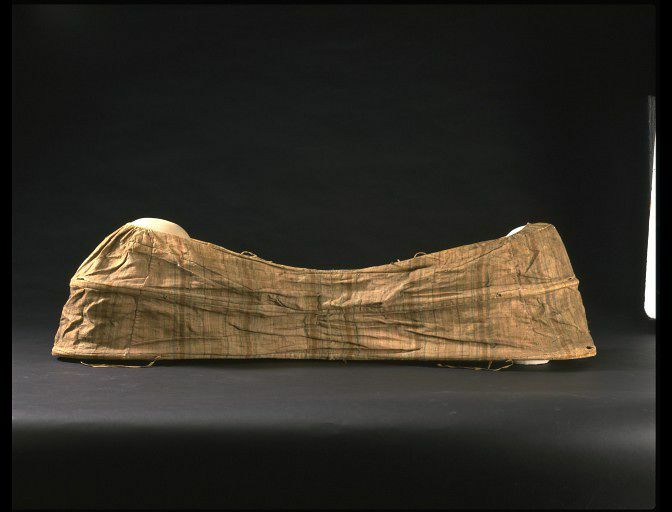 From baleen boning (sometimes including information on thickness), to steel, wood, extra layers of linen, leather and paper. They also include pictures of how exactly all those layers are put together. For the hoops the layers are a bit less relevant, but these also include information on how hoops are attached to achieve the end result. The book finished with a chapter on how to recreate the garments in the book. It includes a number of pictures of replicas made by the School of Historical dress, so you can see some of the more fragile objects mounted as well. One personal favourite bit is the description (based on a primary source) on how to draw the patterns for stays. Very interesting if you want to make them yourself! It even includes a list of where to get materials, and what to use instead of baleen. The chapter ends with a list of terms, with historical terms and their translations in English, French, German, Spanish and Italian, and sometimes Swedish or Dutch. It’s really a beautiful book, and highly recommended for everyone who wishes to know more about these garments. With a lot of new knowledge, filled with beautiful patterns, and details of original garments. 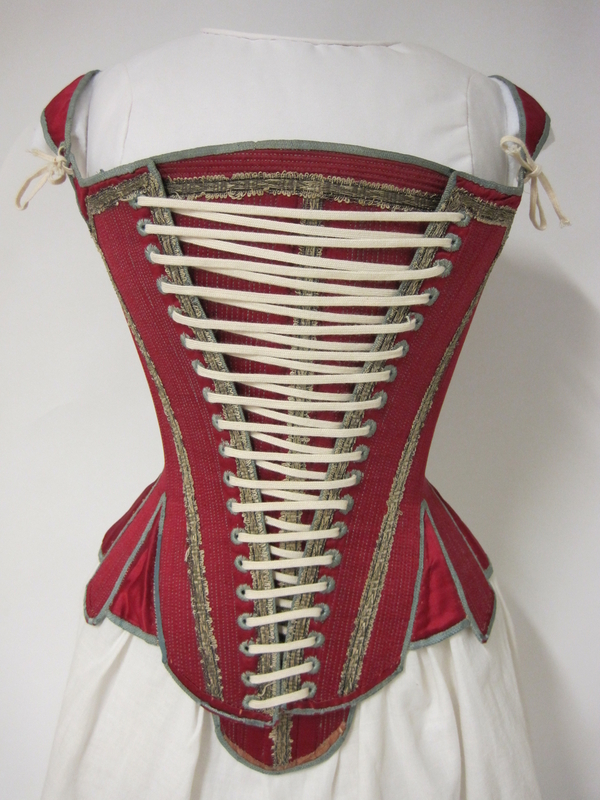 The book can only be ordered via the School of Historical dress (ISBN: 978 0 993174421). Edit per 20-11-2018: The copies are back in stock, but as they’re such a small team, they are only putting up the next 100 copies for sale once they’ve processed the previous. So if you see an ‘out of stock’, just keep checking their website! It’s well worth the wait. Also, the ladies from American Duchess made a wonderful podcast with an interview with Jenni Tiramani, which I thoroughly recommend if you want to learn more about how this book came about. (Part I and II). In December I got a couple of new costume books, including the Tudor Tailor! I have never made anything pre 1800, but I love the Tudor period in style, and I was very interested in the information and the patterns it would include. So far, I’ve been really happy with it, the background information is really nice, as I didn’t know a lot about this period. The patterns provided give options for creating several full outfits, both male and female, from undergarments to dresses and head wear. I’m not sure if/when I’ll actually get around to making Tudor things, but it’s always fun to plan and dream. The book covers various eras and styles, but for now I’m focusing on the ‘typical’ Tudor dress, ca. 1530-1560. So some of my favourites. I’ve found that many portraits showing Tudor fashion show a black and/or red coloring. So I figured I’d organize by color. I’m not sure how accurate the pearls on the hem are though. And I’m curious what’s hanging off her belt! Another black/white/gold dress, although it looks like she has white undersleaves and a white kirtle on (showing the skirt between the open front). This time it looks like embroidery which gives the white details. I’m also intrigued by her necklaces, and the way they fall so wide. And she has the initial-necklace! I’ve only seen this on Anne Boyelin before (with a B), but I don’t know that much on the period, so I think it might’ve been a trend! Another black dress with different color sleeves and kirtle. 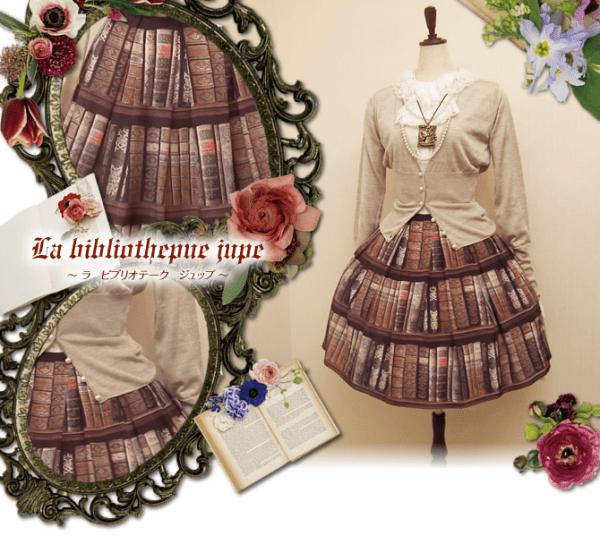 The quality of the image is not great, but the silver/red combination of her sleeves & kirtle is interesting. Her outer sleeves seem to be made of fur, not sure I like the look that much. But, she does have pearls! Princess Elizabeth, c. 1543-1547. ‘The Family of Henry VIII’, detail. Anon. Hampton Court Palace. © The Royal Collection. A similar color combination, but with red as main color. The sleeves & kirtle look wonderfully intricate, and her partlet seems to be embroidered with gold. It’s also interesting that her outersleeves are a different color and fabric. We’re moving into the realm of different colors now! Although I believe that red/gold was quite a popular combination. In any case, the brocades are gorgeous. Still not a fan of fur sleeves though. To finish, one of the only portraits I’ve found where the dress is not black/gray/red/orange/golden toned. I haven’t really been able to find other purple/blue/green examples. This is probably also because the bright versions of these colors were hard to create in Tudor times. (I know the green dress Natalie Portman wore in ‘The Other Boyelin Girl’ is gorgeous, but no way they’d been able to achieve that color in the 16th century!) Nonetheless, this portrait is a lovely example. I particularly like the fabric of her sleeves, and the way her left (for the viewer) sleeve seems to be almost falling off showing her kirtle beneath. I’ve always loved reading. As a child, I always read at least 30 minutes every evening and was constantly visiting the library. Nowadays, with a busy schedule and full job I do most of my reading in the train. The only advantage of travelling 2 hours every day is that I’ve plenty of time to read. This skirt also has a coarser weave, but it’s actually quite nice. So I decided to just go for the heavier fabric. On a visit to Amsterdam I went to the store where I found the fabric online, and bought it. I’m glad I didn’t order it online, because I found that with natural light and scale it’s much easier to judge fabric than from an online image. 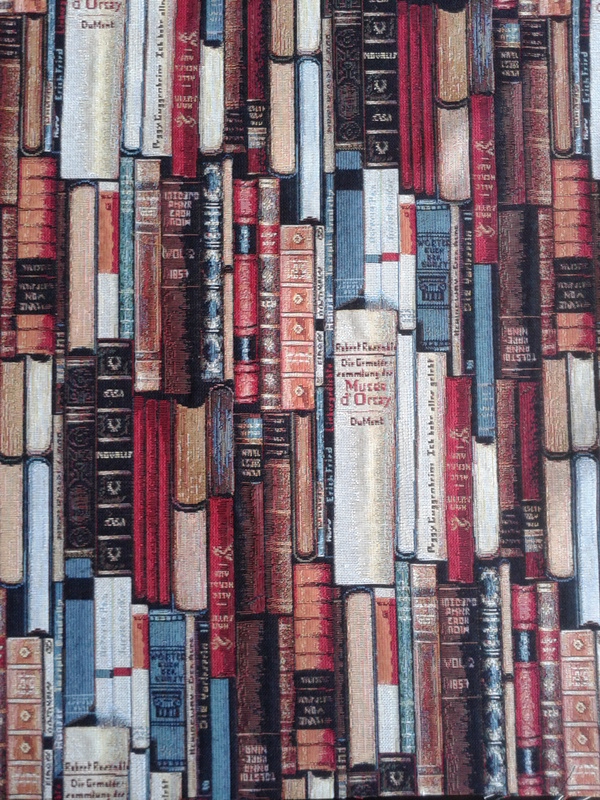 This was the fabric I bought. It’s not very supple, but it that also makes it stand out on it’s own quite well. It rarely needs a petticoat. I really like the pattern and colors of the print (or weave in this case). 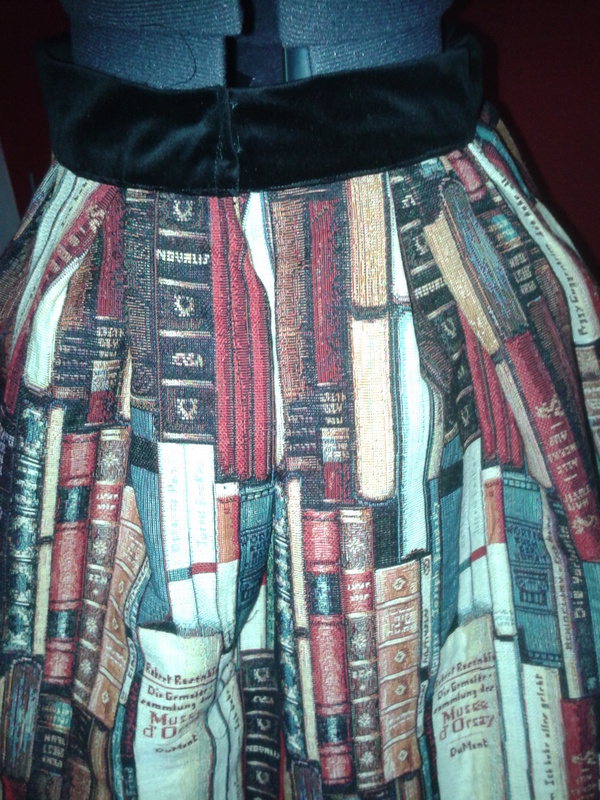 By now the skirt is done! Some progress pictures (all taken with my phone in bad light, so sorry for the quality). 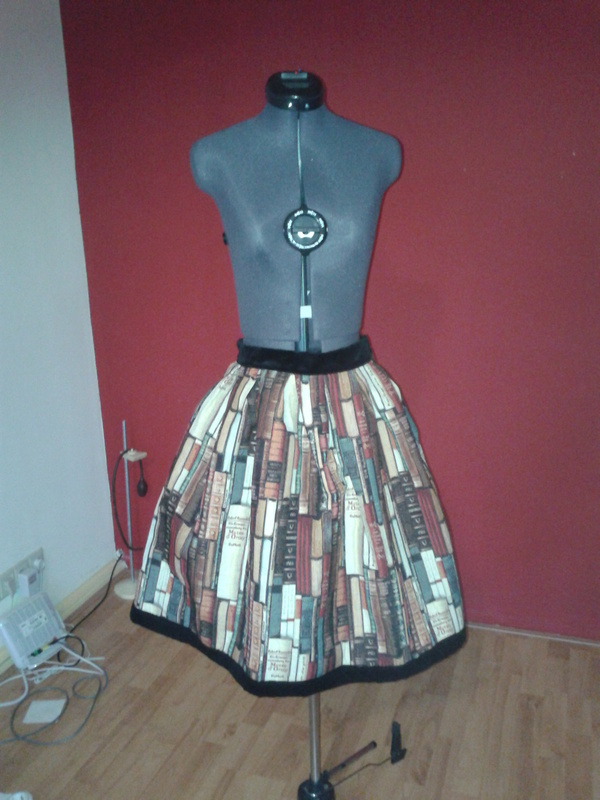 I made the skirt in my standard bell pattern of a large pleated rectangle. I cut the rectangle, and then made box pleats of 2 inches wide each. 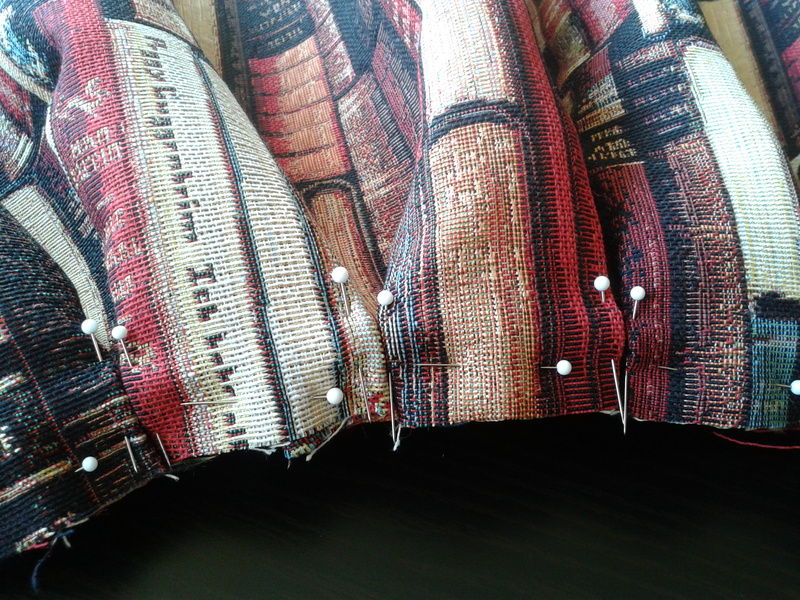 After everything was pinned in place, I sewed the pleats in place. Next up was the waistband and hemming. I wanted something contrasting, and looked at some black lace I still had for decorating the hem. It didn’t work so well, because all the lace was rather subtle and the book fabric is not. 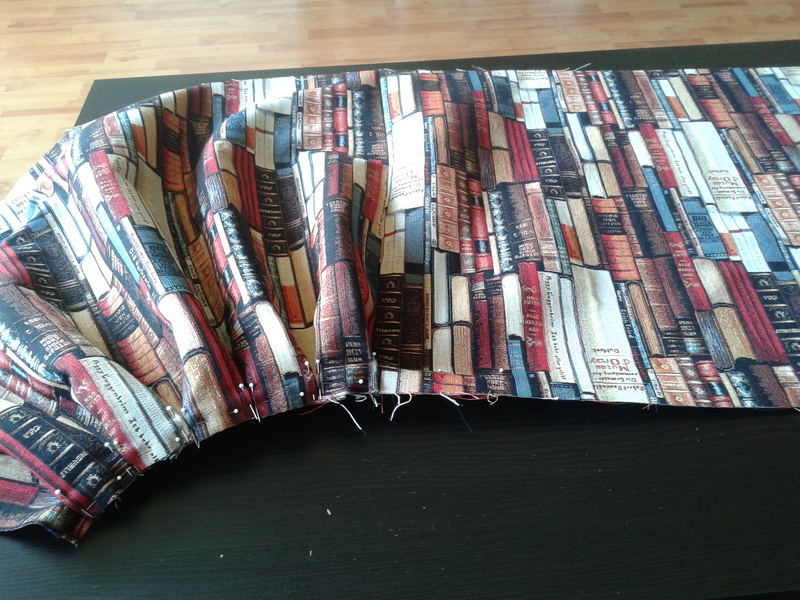 I finally settled on a black velvet border around the hem, and a waistband from the same fabric. Then came making the closure, and this was also when the trouble started. I bought a blind zipper, but had loads of trouble putting it in. My sewing-machine wasn’t getting the tension right thus creating a very loose seam, and the fabric was so stiff that it just didn’t look right. After trying again 3 times, I gave up and removed the zipper again. The fabric just wasn’t supple enough for a blind zipper. Instead, I made a clasp closure and made a little panel behind it so it wouldn’t fall open. This shows the eventual closure. This actually works quite well, so I think I’ll be doing more closures like this in the future, especially when working with heavy fabrics.